I just pushed sqldeveloper 1.1.3. There's about 200 bug fixes in this build some more visible ones are here. There are a couple new things like a couple more sqlplus command supported , print , accept. The other thing that you will notice is new reports. 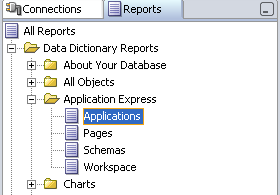 Mike Hichwa added some reports for Application Express. So now you can easily see the applications you have access to and some details about them. The best thing about these reports is that Mike added them using nothing more than the report dialogs. The only thing that was manually added was the check for version of apex and that was just editing the xml file. Here's what the Applications report looks like. Here's another that let's you see the images the workspace. The only down side is that APEX 3.0.1 is required and it hasn't been released yet. Do you know more about these reports? I suppose they are based on the APEX dictionary for ex. 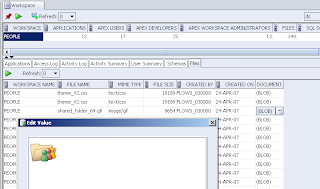 for Applications: on the APEX_APPLICATIONS view? Yes, they are all based on the public APEX_% views. hello and thanks for your interesting posts! i have an emergency - can you help? apec seems to have disappeared from my http gateway - but the schemata are still there in the DB. so - i want to export my app with sqldev/jdev. when i try this however i get 1 0kb file and an error msg - "gettDDL - null"
any insights ? THANKS !!! !